Wireless headphones represent freedom! The freedom to move around while listening to your favorite music without being bothered by annoying and awkward wires. Whether you are at home, doing sports, traveling, at work, or in a studio, a high quality wireless headset can always be counted on to deliver concert hall quality music to your ears without the clutter of cable between your source device and your ears. Various types of Bluetooth wireless headphones have recently flooded the market as more and more manufacturers have been getting into the act. Indeed, nowadays, there are so many choices that selecting the right Bluetooth wireless headphones can be a somewhat difficult and confusing task. Note that these headphones were not only the most popular among Amazon customers at the time this article was written, but they had also received raving reviews from Amazon customers (an average rating of 4+ stars, out of 5 stars) as well as from independent reviewers. Note 1: On-ear headphones are equipped with ear pads that cover the outer ear. Over-ear headphones have larger ear pads and they encircle the ears. In general, the quality of over-ear headphones is richer than on-ear headphones and there is more insulation from external noise. As long as your source device supports Bluetooth (be it an iPhone, iPad, iPod, iMac, an Android smartphone or tablet, a PC or any other Bluetooth supporting device), all three selected headphones covered here allow wireless communication between the headphones and the source device. NFC (Near Field Communications) allows pairing with your NFC-compatible device with a simple tap of your device to the headphones. Bose SoundLink headphones do not come either with the ANC feature, but they may physically block some noise thanks to the earcups that fit the ears closely with soft, thick padding, sealing out quite a bit of ambient sound. 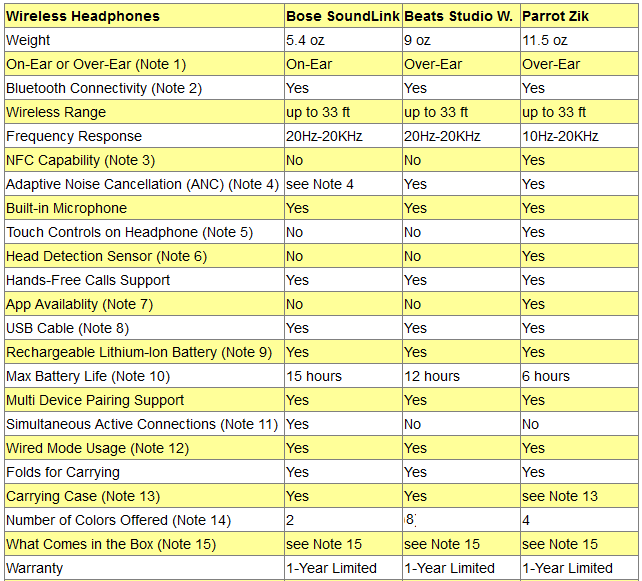 Beats Studio and Parrot Zik have both implemented ANC. The Parrot Zik headphones are equipped with an intuitive touch control panel on the right headphone. When connected via Bluetooth, sliding your finger vertically adjusts the volume and sliding horizontally skips to the next track. On Beats Studio headphones, the controls are done by clicking different buttons on the surface of the left headphone. Single click center button for play/pause, double click to skip track, and triple click to go back a track. Click below center button for volume down and above center button for volume up. On Bose SoundLink headphones, controls are also done by clicking buttons on the surface of the right earcup. This feature is only available on the Parrot Zik headphones. A head detection sensor is incorporated in the earcup, allowing the device to detect automatically if you have removed the headphones, or if you are wearing them, and as a result pausing and restarting the music. Neat feature! The Parrot Zik headphones come with their own app, the Audio Suite. It provides you with a virtual control panel for the headphones on your smartphone. It allows wireless management of the noise cancellation feature, choosing equalizer settings, applying concert hall effects, checking the battery level, accessing the help desk, and more. It also allows you to update the headphone software/firmware/configuration by wireless transfer of the data from the smartphone to the headphones. The app is available for both iOS (Apple) and Android devices. There are no specific apps available for the Bose SoundLink and Beats Studio headphones. Recharging the battery can be done by connecting the headphones to your computer’s USB port using the USB cable. The USB cable can also be used for downloading software updates from the computer to the headphones. But at this time this feature is used by the Bose SoundLink and Beats Studio headphones. To update the headphones, the headphones provide a computer application (for PC and Mac) that allows for immediate software download of updates directly into the headphones when these are connected to the computer with the USB cable. To update the Parrot Zik headphones, you don’t even need to use the USB cable, as it is done wireless via Bluetooth. You just download Parrot Zik's app to your iOS/Android device. Then, connect the headphones to the device via Bluetooth. Now, with the headphones connected to your device, within the settings section of the app, you will find an option to update the software on the headphones. The app will display your current version number, and it will tell you if a newer version exists. If so, you will be given the option to initiate a software update. Recharging the battery is done either by connecting the headphones, using the USB cable, to your computer’s USB port, or by connecting to a wall power adapter. Note that only Beats Studio includes in the purchase a wall power adapter. The numbers given here correspond to the situation when the headphones are active and connected through Bluetooth. The numbers would be larger in standby mode. 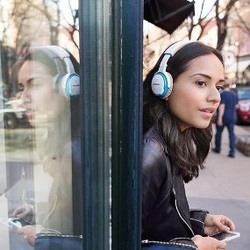 Bose SoundLink headphone can connect simultaneously to two Bluetooth devices. Beats Studio and Parrot Zik headphones can be paired with more than one device, however active connection can only be with a single device. All three headphones can be used to listen to your favorite audio sources (DVD/CD players, digital music players, and computers) in non-Bluetooth mode with the 3.5mm audio cable included in the package. But note that if the headphones have no power (dead batteries), Beats Studio will not work even if it is connected with wire to source device. Bose SoundLink: Black and white. 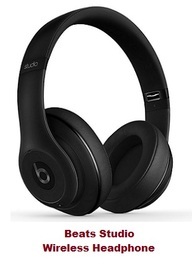 Beats Studio: Black, blue, matte black, red, titanium, white, gold and metallic sky. Parrot Zik: Black, black-gold, rose-gold and yellow-gold. 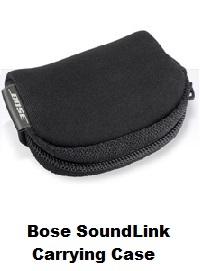 Bose SoundLink: Headphones, audio cable, USB cable, carrying case. Beats Studio: Headphones, Remote Talk cable, audio cable, USB cable, USB power adapter, carrying case and cleaning cloth. 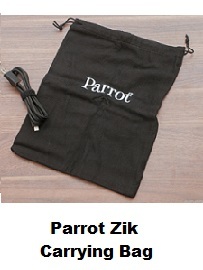 Parrot Zik: Headphones, audio cable, USB cable, protective bag, quick start guide. So which of the three wireless headphones to get? Bose SoundLink claims that they use their well proven TriPort technology which works with active equalizers to deliver music as dynamic as the best wired headphones allowing you to appreciate all sounds in the music from the deepest lows to the clearest highs. The sound quality is indeed impeccable, and so clear that you can use them not just for music, but also for books, movies and TV shows. You are able to hear bass and treble in balance with no overpowering bass, and many users have said that notes and dynamic levels that can't be distinguished through stereo speakers or earbuds can be detected here. This may sound surprising when you think that these headphones do not have the Adaptive Noise Cancellation feature. But the physical structure of the earcups which seals out quite a bit of the ambient noise may explain partly the high quality of sound. The earcups fit the ears closely with soft, thick padding and are very comfortable to wear for extended periods of time which is good since the battery here can last up to 15 hours! Note that the sound of calls taken through the Bluetooth headset could be a bit clearer, but this problem is inherent to most Bluetooth headsets. Finally, these are are quite fashionable looking headphones. 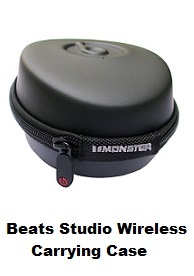 Beats Studio Wireless uses DSP (Digital Sound Processor) software to create a real and pleasant musical experience. The sound quality is quite good at mid ranges without overpowering bass which is well controlled. Vocals are very clear and high pitch sounds are heard very nicely. But best of all, here you have the Adaptive Noise Cancellation feature which contributes greatly to the quality of the sound. But note that with ANC on, when there is no music, some white noise (hissing sound) may be heard. Finally, these headphones are very comfortable to wear for extended periods of time. They have a sleek and low-profile design, large and plush ear cushions, and the headband is adjustable and strong, yet quite comfortable to wear. One problem many users found as an inconvenience and that you should consider before buying these headphones is that they stop working when the batteries die, even if they are used in wired mode without Bluetooth. Parrot Zik also uses DSP (Digital Sound Processor) software and has Adaptive Noise Cancellation (ANC). With features like the ability to create concert hall effects and control the equalizer, it recreates true-to-life sound with a unique quality which mimics the sound of a live concert. Indeed, when you enable the ANC and set the equalizer to a level you like, these headphones come truly alive! This is something to experience to really understand! The audio quality is so well balanced: the mids are great, the highs are quite good, and best of all there is no thumping and overpowering bass. Also worth to point out is the lack of distortion when music is played at extreme high and low frequencies. The ANC feature, which can be turned on and off, contributes to the high quality of sound. But note that, as with the Beats Studio headphones, with ANC on, and when there is no music, some faint white noise may be heard. However, as opposed to the Beats Studio, when the battery dies on the Parrot Zik headphones, you can still hear music in the wired mode. But the quality of the sound may not be as good as when the battery is charged. These headphones were created by the famous French designer Phillipe Starck. The flat sides of the earcups have a stylish yet minimalistic feel and lend themselves well to the touch controls. The earcups are extremely comfortable, and the smart design that incorporates smart articulation and adjustment for the right amount of over-ear pressure makes wearing them for prolonged periods very easy. But note that these headphones may not be the best for exercising or running, as the clamping pressure may not be strong enough to hold them on. But they are perfect for listening while sitting or walking at a reasonable pace. The Zik has been called by many the Porsche of headphones! If you can afford them, we think it should be your first choice (note that its Amazon price is very close to a Beats Studio Wireless price). Not only does it supports features like NFC and ANC, but it also comes with an app that can be used as a virtual control panel for the headphones, to manage the various features and to update the headphone firmware/software when changes are available. And when you think of the superb sound quality and superior comfort the Zik offers, the price may be justified. 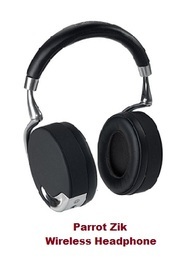 Note: Parrot has recently developed a new version of the Zik, the Zik 3.0 headphones that include all the desirable elements that made the success of the first generation Zik. The new Zik 3.0 headphones are redesigned wireless headphones that are more comfortable and lighter than the original Zik. They also provide improved calls quality and integrated voice recognition, better autonomy and a new app to control, customize and share your music. Both the original Zik and the new Zik 3.0 are available below in the Amazon products section. Please click the product of your choice below for price information or to purchase. When you click the Bose Soundlink, Beats Studio and Parrot Zik headphone images below, you will be provided with a choice of colors. New automatic adaptive noise canceling and stunning 32-bit audio processing. Smart touch control panel and Bluetooth 3.0 audio streaming. Wireless or USB based charging. Ability to listen and charge simultaneously. 18 hours listening with "flight mode". Ability to control, share and customize your music with the updated free Zik app. Have you not found the wireless headphone you were looking for?